Stu Ungar is one of the most recognized names in poker. He was the genius player who was nicknamed “The Kid,” and won the World Series of Poker Main Event three times. However, cocaine use and sports betting ruined his life, and he died broke on November 22, 1998. Stu Ungar was born in New York City on September 8, 1953. His father was a loan shark who ran a gambling joint, and this exposed Stu Ungar to gambling, despite his father’s efforts to keep Stu away from gambling. Stu’s father passed away, and Stu Ungar quit school to support his sister and his mother, who was also sick. Stu Ungar did this by playing gin rummy, a game at which he said there would never be anybody better than him. However, he eventually had to leave New York because of the gambling debts he had incurred at the race tracks, he moved first to Florida, and then to Las Vegas. He was so good at gin rummy that opponents refused to play him, and casinos had to ask Stu Ungar not to play in their tournaments, because nobody else would play if he did. 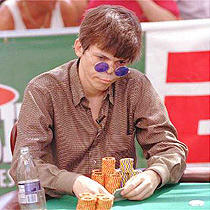 Stu Ungar started giving handicaps to his opponents, and would even play against cheaters, he still beat them all. While in Las Vegas, Stu Ungar met a girl who would later become his wife. In 1980, he entered the World Series of Poker Main Event, primarily because he was looking for some more high stakes action. Stu Ungar defeated Doyle Brunson to win the 1980 World Series of Poker, becoming the youngest person to ever win the Main Event until Phil Hellmuth took the title in 1989. Stu Ungar would go on to win the 1981 World Series of Poker Main Event as well. Stu was also a great blackjack player thanks to his incredible memory, but he was banned from blackjack in almost every casino. Stu Ungar legally adopted his wife’s son Richie, and together he and his wife, Madeline, had a daughter, Stefanie. Richie committed suicide soon after his high school prom, which hurt his parents deeply. Stu and Madeline ended up getting divorced in 1986. Stu Ungar started using cocaine, and it soon took over his life. At the 1990 World Series of Poker Main Event he was found unconscious in his hotel room. Despite having all of his chips taken away through the blinds and the antes, Stu Ungar had so much of a chip lead that he still finished in 9th place. Stu would frequently win a lot of money playing poker, but would lose it all on drugs and gambling. Stu’s good friend, Mike Sexton says that Stu went from millionaire to broke and back at least four times. One of Stu’s friends staked him to the 1997 World Series of Poker Main Event. Stu won the event, and people started calling him “The Comeback Kid.” He would lose all the money he won from that event as well. His friend was going to stake him in the 1998 WSOP Main Event as well, but Stu backed out a couple days before the poker tournament, thinking that in the condition he was in, thanks to the drugs, it would be more embarrassing to show up. Stu Ungar virtually disappeared afterwards, and a few months later, on November 22, 1998, Stu Ungar was found dead in his hotel room with only $800 left to his name.